Pineapple and coconut are two of my favorite flavor combinations. Since we are smack dab in the middle of winter, I thought, what could be better than the taste of the tropics. 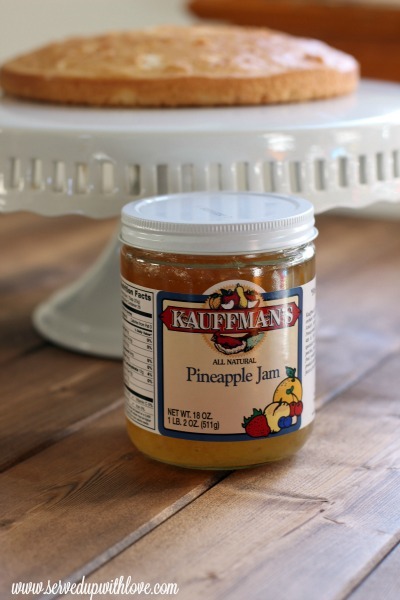 For my selection this month from Kauffman’s Fruit Farm & Market, I chose the Pineapple Jam. I knew I could create a great recipe that everyone would enjoy. I reminisced about those Hawaiian Tarts that I made for my sisters bridal shower many years ago. I remember having so much trouble finding the pineapple preserves then so I was super excited to see that this jam was offered through Kauffman's Fruit Farm & Market. You guessed it, those tarts are next on my list of must makes this winter. Of course, with any jam, there is a level of sweetness you have to consider when making a recipe. When making a cake that is already sweet, you do not want it to be overly sweet. 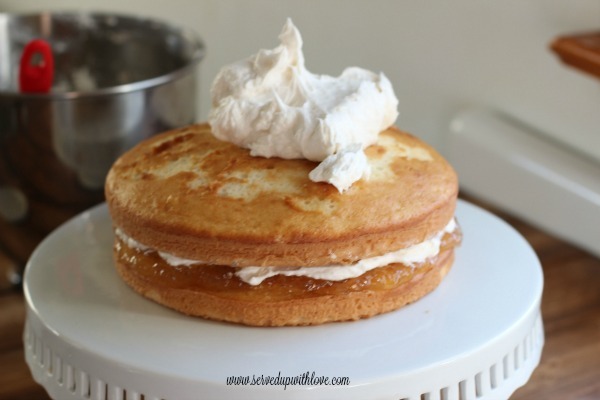 I utilized a box cake mix because we can all use a time saver these days. 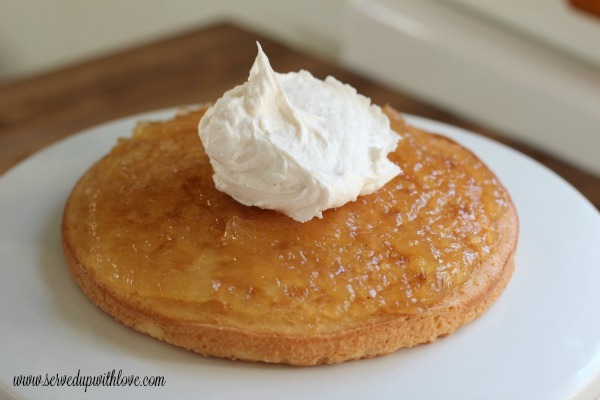 You can certainly use your favorite homemade cake recipe if you prefer. For me, it was a matter of making this one easy. While preparing the cake mix I remembered having some coconut extract in my cabinet. 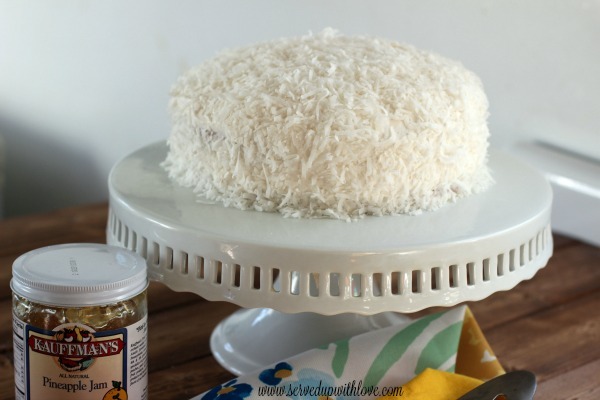 The wheels in my head started turning and I just knew I needed to use it to jazz up the coconut flavor in the cake. As I opened the bottle of extract and took a whiff, I felt like I was on a sandy beach somewhere soaking up the sun. Hey, whatever gets us through this cold weather, right? I did make my own buttercream icing for the cake. Just because I forgot to buy a can of frosting and I wasn’t about to go out in the cold to get it. It wasn’t much trouble at all to make. Between the coconut extract in the cake mix and the buttercream icing, you couldn’t tell it was a box cake mix at all. This cake was a winner in my book. The perfect amount of coconut flavor paired with just a hint of pineapple. It was really dangerous having this cake around the house. My hubby, although he likes coconut flavor, he is not a fan of the texture of the coconut. So I did what any great daughter would do, I shared with my parents. They were super happy when I made my delivery and really enjoyed it. Kauffman's Fruit Farm & Market has a wide variety of jam and jellies in their online store. You name it and I bet it is there. While you are there browsing, check out all they have to offer. Make the white cake mix according to the directions on the package in 2- 8 or 9 inch round pans. Add the teaspoon of coconut extract to the cake mix. Allow to cool on wire cooling racks before icing. 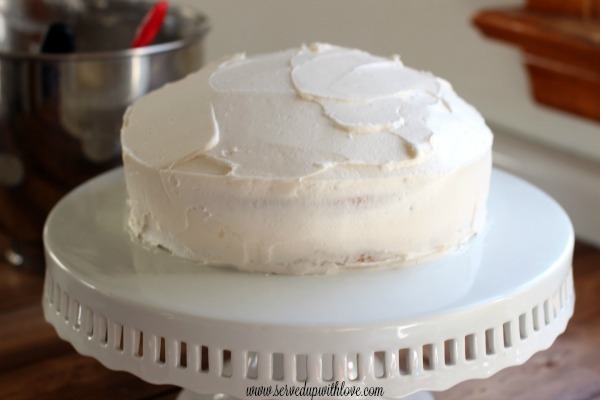 Place first cake layer on cake stand or plate. I usually put about a teaspoon in the middle to secure the cake before placing on the stand or plate. Cover the first layer with a layer of pineapple jam. Do not go all the way to the edge so it is not to mix with the icing on the outside. Add a layer of buttercream icing on top of the pineapple jam. Place the second layer of cake on top of first layer. Spread the icing on the sides and top of the cake. 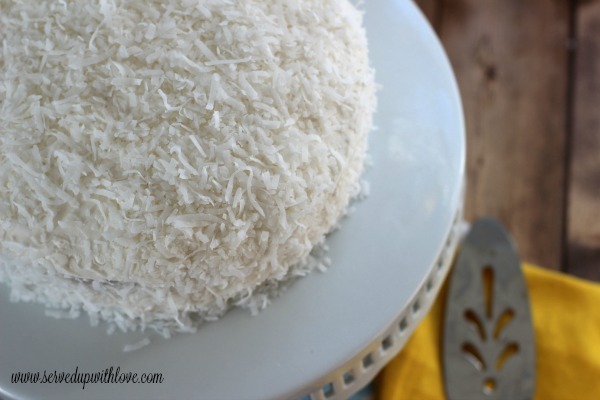 Cover with coconut flakes. Oh WOW! I'm not overly fond of cake, but I think I could seriously enjoy a couple of pieces of this delicious dish. YUMMERS! I am love! Marsha, above says she isn't overly fond of cakes, but I have to tell you, cake is my biggest indulgence, I just love, love, love it! Add coconut and I am absolutely over the moon! 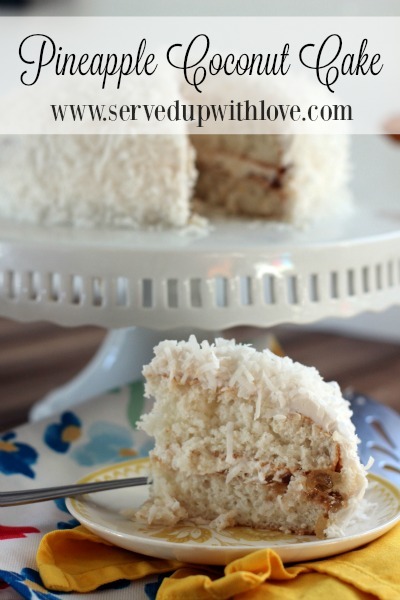 I am pinning this to my coconut board and would be so happy if you would indulge my readers by sharing over at Celebrate and Decorate's Celebrate Your Story link party! Yum, yum, yummy! 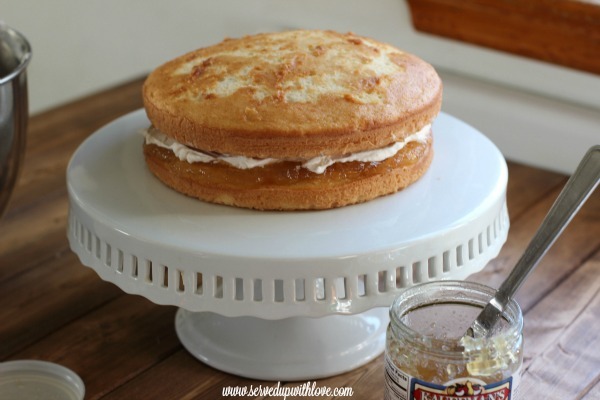 Bet this cake smells and tastes like a little piece of paradise! i know what I'll be baking this weekend! Thanks for sharing. Thanks ladies, this one was dangerous to have around the house! I couldn't stay out of it. Thanks for stopping by. I love pineapple and mixed with coconut...yummy! Thanks for sharing on Merry Monday. Pinned. You had me at pineapple cake. 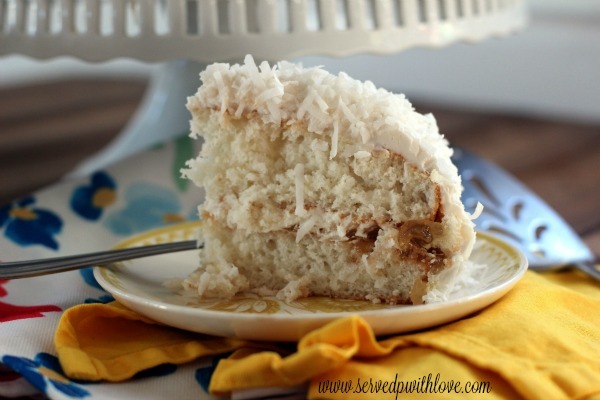 The coconut is literally the icing on the cake for this recipe! Thanks so much Erlene and Crystal, thanks for hosting such great parties!